An example NW9290 Transformer Assembly. Over the years, a number of passenger cars have been built with 240 volt, 220 volt or 208 volt three phase electrical systems. The reasons for this varied. Some isolated tourist systems used a 240 volt HEP system because it was cheap to implement. Under-car generator systems were frequently installed that were 240 volt or 220 volt. Yard power systems of all three voltages still exist, particularly on the east coast. Today, however, 480 volt three phase power is the standard HEP voltage. The NW9290 was designed to convert these existing lower voltage cars to 480 volt HEP compatibility. 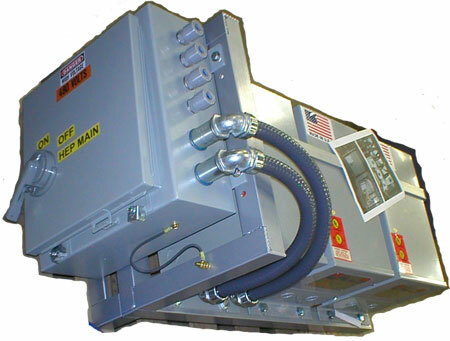 This single transformer assembly includes 480 volt to 208, 220 or 240 volt transformers, with a HEP main circuit breaker that locks the lid closed when it is turned on. Although the same basic components are used on each NW9290, the specifics of each assembly change based on voltage, current, and mounting rack that is required under the car. Therefore, while this is a "custom product" in the sense that we need very specific detailed information on each application, it is also true that we have built quite a large number of these. Incoming Voltage (normally this is 480v, but some customers need 575 or other voltage, depending on their operating situation. Amtrak standard HEP Main Breaker? Or some other HEP main breaker? Amount of power consumed by the car? Units up to 135 kVA have been built, but the bigger the transformer the bigger the price, and the larger the physical size of the unit, and the more substantial the frame to support the transformers. It is best to size the unit to fit the actual needs. Some sort of drawing as to how and where this is going to be mounted onto the car, desired orientation of transformers, etc. Under-Car Generators for providing electricity to the HEP system. Generator Control Systems designed specifically for the needs of railroad passenger car generator systems. Electrical Locker Packages for converting railroad cars to HEP power.